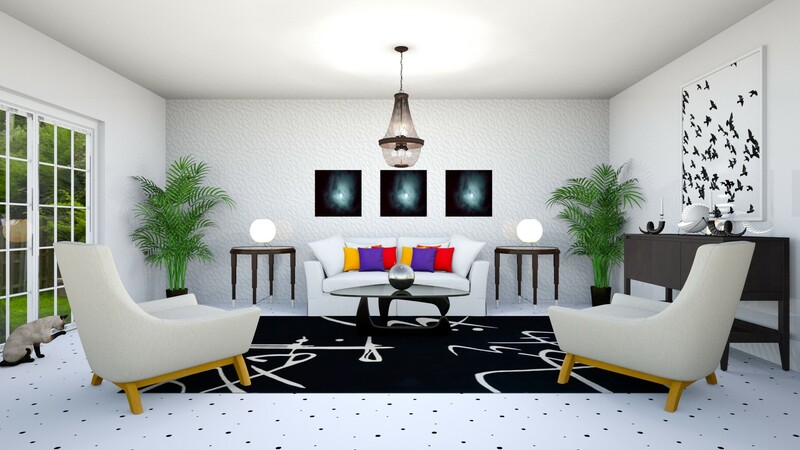 Why not try using black and white as your main colors in your Interior Design? It will make the rest of your colors really pop! Forget the gray; go for high contrast and drama! Whether your room is light and airy with white walls or dark and moody with dark charcoal walls, you will create a dramatic room sure to make a statement. Get dramatic with black and white to make the rest of our colors really pop and create drama. Get a light, bright and airy space with white walls, flooring and ceiling. 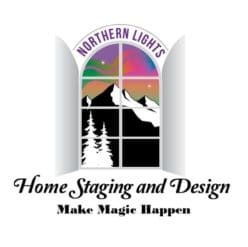 Edesign by Northern Lights Home Staging and Design. Create a dark and moody look with charcoal walls. 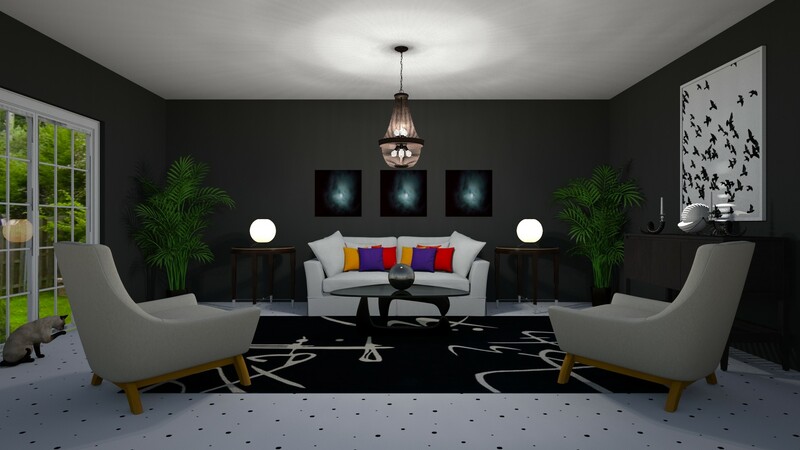 Using black and white is a timeless classic, gives a modern look and can satisfy your love of color or your desire to have little color while creating a beautiful space. Why does it work? Because of the high contrast! Alone, black and white bring the ultimate contrast with each other. Any color you bring in against either the black or white creates high contrast. For the boldest design, use saturated bold colors such as jewel tones as accents. Bring in pops of color in your accessories, art or a colorful accent chair. These are also easy to switch out over time to give lots of variety in your design when you are ready for a change. Create a beautiful focal point with an amazing rug or wall art and build the rest of your room design around your focal point. Take a cue from the style of the rug or art to build the rest of the room. For example, a Moroccan rug is a great start to build a bohemian style or global style room. Find a rug or art that has some black and white in it, to help pull everything else together. For example, in the mood board below, I used the Moroccan rug as a the focal point to create a global or Bohemian style Interior Design with a modern twist. I used some the ethnic pillows, the chandelier and the lamps to add to the global/Bohemian vibe. I selected a modern abstract painting with lots of color to add that pop of vibrant color I wanted to contrast with the black and white. From the colors in the art, I selected two modern comfortable chairs in the red color from the art, and the accent bowl for the table to pull out the beautiful the blue in the art. I selected simple modern coffee and end tables with black finishes and marble tops in black and white. 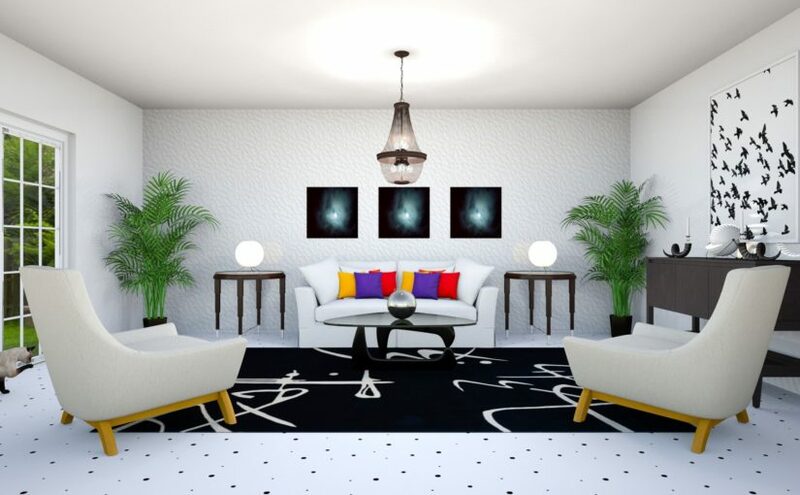 I loved the black and white abstract art, so simple and clean to use on the adjacent wall and coordinate with the modern touch both pieces of art bring to the room. And finally, when I saw the dancer within the black circles, I thought it would be the perfect accessory piece. Being a dancer myself, I am partial to dancer art! In any case, it expresses joy, which I hope is what you feel when you see this room! Get Dramatic with Black and White! Try some of the following design elements to get the look. Click on the picture to find out more. If you like some of the pieces in this design, you can click on the picture to go to a pin I created on Pinterest which links to most of the products I used. Click on the picture or here to find out more about the items. 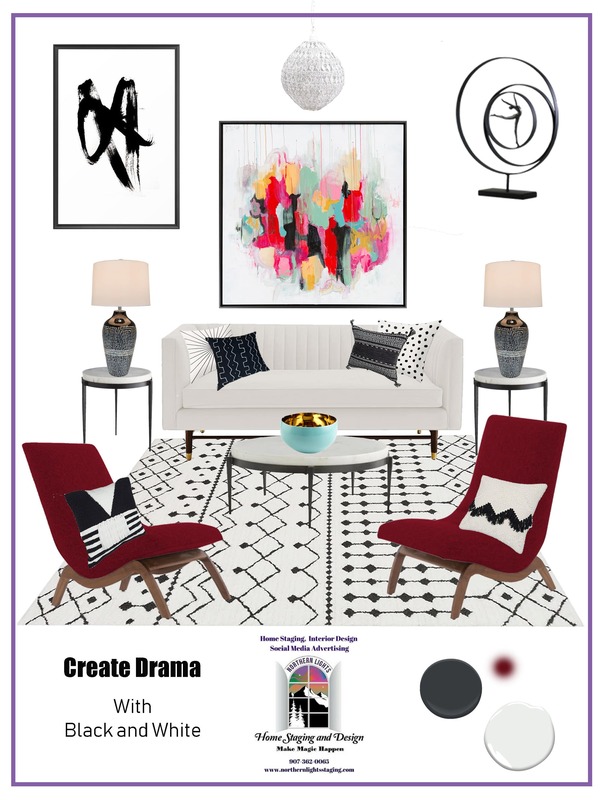 While you are on Pinterest, feel free to check out other great ideas and additional products for your black and white design in my Interior Design and Home Staging Products I Love board. 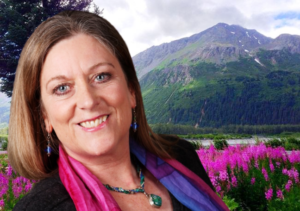 Follow me on Pinterest to get great ideas each month. 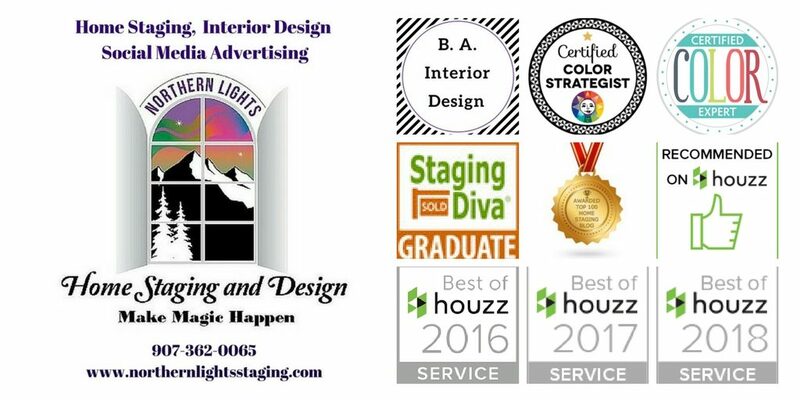 If you would like help pulling together a dramatic room, globally inspired or Bohemian style Interior Design in your home, feel free to contact me and we can work together in person or online using Edesign to create the perfect space for you! Black and white is always a classic design choice, and you can really turn up the drama if that’s what you like. Loved your picks and this info! Thanks Jill! Glad you enjoyed it. I love color and enjoy showing it off with black and white. Classic design choices are also great to give your design timeless appeal. The contrast of black and white is definitely dramatic and it translates well into any decorating style. And I love the dancer sculpture you selected! Oh thanks so much. I perform and teach dance and when I saw it, had to put it in the design! I love your emphasis on Moroccan themed decor, Mary Ann. That’s the theme of Seasonal Living Magazine’s latest issue, and your post shows off the style so well! Thank you Leslie, that is a great compliment because Moroccan is my favorite design style! Your new cover is beautiful! What a great post! I love your examples and how you can shop your mood board right on Pinterest. I didn’t know that was possible. Love your website too, very clear! Thank you Deborah! Yes, this is a new feature on Pinterest, but your post must be connected to your website to add product tags. I love how it can make it easy for someone who loves the look to find the products quickly and easily. So nice to hear that you like the website and it is clear for visitors! Very important!